Kitchen table, dining table, desk table, garden table, … Its design is so simple, minimalistic, that it can really be used in all environments. A sober and elegant design for multiple uses. 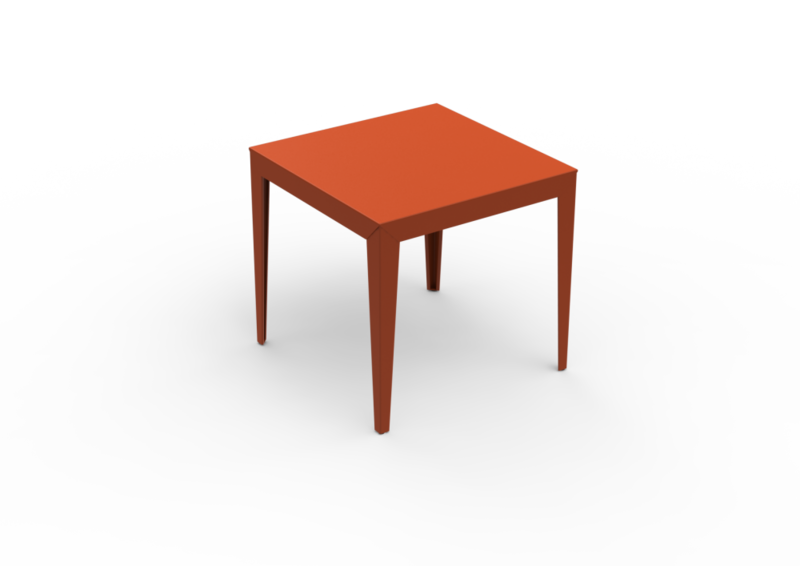 This table is very easy to assemble: 2 screws per leg. It is also extremely resistant. The combination of top sizes, heights, leg shapes and colours enables to satisfy a lot of needs. The table is painted with epoxy powder and provided with screws, tools to assemble it, and adjustment pads for irregular floors. Luc Jozancy was born in auvergne in 1960. Having spent his childhood in this unspoiled country setting, he then undertook a series of courses with creativity as their common denominator: ESAG Penninghen, Beaux arts de Bourges and ENSAD Paris, where he obtained his diploma in industrial design in 1985 under the guidance of Roger Tallon. Even as a student, he very soon came into contact with industry, with many of his prize-winning study projects catching the eye of businesses such as Lumen center, Le Printemps, Mulca and others, and subsequently being developed. Having been spotted by a professor, he joined his agency Solus as industrial designer, working with companies from vastly different fields, among them Danone, Yves Saint Laurent, Nathan and Plastic Omnium. It was during his time at this agency that he met eric Rhinn with whom he was to set up the Avant-Premiere design studio in Lyon in 1988. The foundation for a user-focused design philosophy was laid, its guiding principles clarity and simplicity in the perception of the object. Year after year, the avant Première studio forged special bonds with the major industrial players: Groupe Seb, Dynastar, Alstom and Boiron, to name but a few. Today, Luc Jozancy, designer, associate director and Head of avant Première’s Product design department, sees research and development and design as the core values for innovation. MG has been working with avant Première in the field of design since 2005..